Over the last few years, director Peter Berg has carved out a nice little niche for himself making unapologetically patriotic films about real-life heroism in the face of adversity. Much like “Lone Survivor” and “Deepwater Horizon,” Berg’s third collaboration with Mark Wahlberg doesn’t really have anything important to say politically, but it’s their finest movie to date and perhaps their most meaningful one due to the actor’s close ties to the city of Boston. 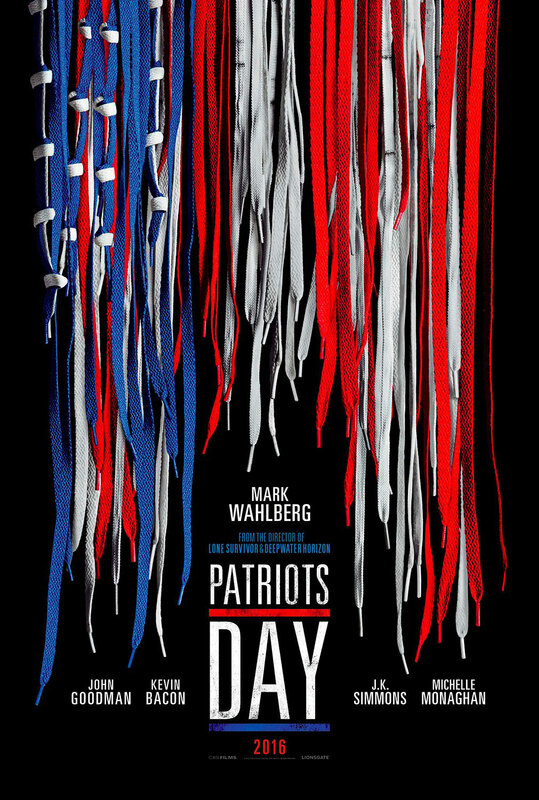 Though some people will question whether “Patriots Day” arrives too soon after the true events that inspired the film, Berg does the story justice with his gripping yet tactful retelling of the 2013 Boston Marathon bombing and the five-day investigation that followed. The movie begins on the morning of April 15, 2013 and introduces several of the key players involved in the tragic event, including Boston cop Sgt. Tommy Saunders (Wahlberg), Chinese exchange student Dun Meng (Jimmy O. Yang), Watertown police officer Sgt. Jeffrey Pugliese (J.K. Simmons) and the bombers themselves, Kyrgyzstani-American brothers Dzhokhar and Tamerlan Tsarnaev (Alex Wolff and Themo Melikidze, respectively), who detonate the homemade bombs about four hours into the race and then return home to watch the ensuing chaos on TV. Meanwhile, law enforcement officials work together under the guidance of FBI Special Agent Richard DesLauriers (Kevin Bacon) and Boston Police Commissioner Ed Davis (John Goodman) to recreate the crime scene and comb through hours of video surveillance in order to identify the suspects, eventually leading to a manhunt through the streets of Boston and the surrounding suburbs to capture them. Everyone remembers the images of the BP oil spill that dominated the TV news cycle back in 2010 – the Deepwater Horizon drilling rig engulfed in flames, the rivers of black crude oil spreading across the Gulf of Mexico – but not many people know the details of what actually happened. It remains the worst oil disaster in U.S. history, and director Peter Berg recreates it in stunningly authentic detail for his latest film. But while “Deepwater Horizon” is a pretty effective disaster movie with some decent thrills and enough explosions to make even Michael Bay jealous, it doesn’t seem to have a purpose. It works just fine as a dramatic reenactment of corporate greed gone horribly wrong, but unlike the real-life incident, it will quickly be forgotten. 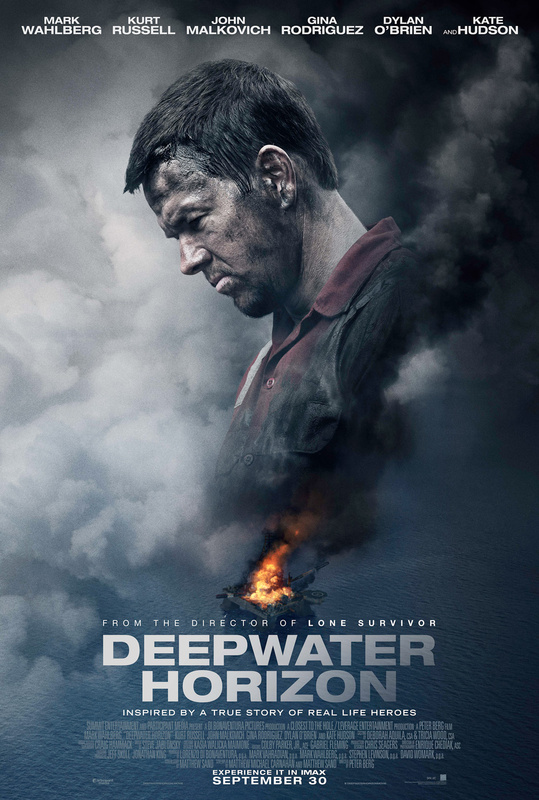 There were a lot of heroes aboard the Deepwater Horizon on that fateful day, but Berg centers on a quartet of Transocean contractors – including chief electronics technician Mike Williams (Mark Wahlberg), crew chief Jimmy Harrell (Kurt Russell), bridge officer Andrea Fleytas (Gina Rodriguez) and floorhand Caleb Holloway (Dylan O’Brien) – to tell the harrowing tale. When Mike, Jimmy and Andrea arrive on the offshore drilling rig for a three-week shift, they discover that an important safety procedure has been ignored due to the project falling behind schedule. Adamant about the safety of his crew, Jimmy insists that they run some additional tests before anyone begins drilling, much to the annoyance of BP executive Donald Vidrine (John Malkovich). After the tests prove inconclusive, Vidrine pressures the workers into starting the job anyway, leading to the tragic accident that claimed the lives of 11 men and caused irreparable damage to the surrounding waters. 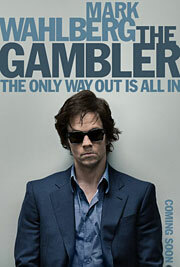 Rupert Wyatt’s “The Gambler” is a curious beast. It’s based on a film that’s just obscure enough that a remake wouldn’t ruffle too many feathers, yet is well-regarded by those who have seen it. In other words, the 1974 original starring James Caan isn’t exactly holy ground, but there’s not much to improve on either, which makes this Mark Wahlberg vanity project feel every bit as irrelevant as the story it’s trying to tell. There’s nothing wrong with flawed characters – in fact, that’s what makes some of the best movies – but when they’re as irredeemable as the one that Wahlberg plays in “The Gambler,” it makes it very difficult to give a damn what happens to him. 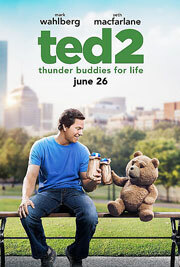 Wahlberg stars as Jim Bennett, a college English professor who gave up on his literary dream after his first novel was met with little fanfare. The grandson of a banking magnate, Jim partly attributes his privileged upbringing to becoming the degenerate, high-stakes gambler that’s led him to his current predicament. After falling into debt with a Korean mobster (Alvin Lee), and then borrowing money from nefarious loan shark Neville Baraka (Michael K. Williams) that he promptly loses on the blackjack table while trying to win back what he owes, Jim is given seven days to pay or else. When his mother (Jessica Lange) eventually caves in and gives him the $260,000 to clear his debt, vowing that it’ll be the last time she bails him out, Jim blows it at the casino instead, putting him in a precarious position when Neville threatens the lives of his two students. If you saw the movie “Lone Survivor,” you know that words really can’t explain the pride one feels after seeing the heroism on screen. Based on Marcus Luttrell’s New York Times bestselling memoir, director Peter Berg explores the unbreakable bond of brotherhood in a film that captures the real life struggles of these proud Navy SEALS. “Lone Survivor” tells the incredible tale of Operation Red Wings, a mission about four Navy SEALs ambushed by the enemy deep in the mountains of Afghanistan. As the soldiers are confronted by unthinkable odds, they must find reserves of strength and resilience in order to fight to the finish. Before the “Lone Survivor” launch on digital HD and Blu–ray June 3rd, Universal Studios brought in a highly-skilled press team (Bullz-Eye, of course, was a key player) to experience first-hand the type of training SEALS go through. Also included in this experience was the opportunity to meet and spend time with Berg and Luttrell, the real-life Navy SEAL who received the Navy Cross and Purple Heart for his actions in Operation Red Wings. 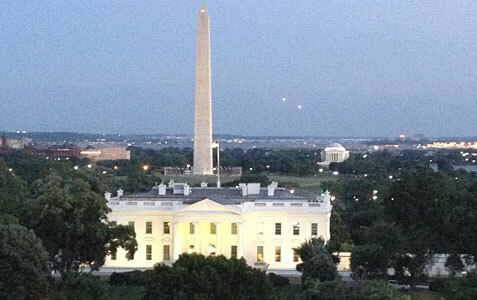 Regardless of what happened on this trip, we knew that just by staying at the Hay-Adams Hotel, it was going to be a memorable weekend, as the Hay-Adams is literally right across the street from the White House and is basically a 5-star hotel. Yes folks, there are times when even Bullz-Eye has to clean up and hang with the elite members of our society. But don’t worry, there were no problems, because we know when to behave! After a quiet evening on Thursday, we were up and ready to hit the road at 5:45 am to take part in true Navy SEAL experiences, including weapons training with Uzis, machine guns and AK 47s, and for those who think rappelling is challenging, that event was available as well. It was an early start, but that was necessary, as the Extreme SEAL Experience was taking place in Norfolk, VA, which took us around 4 hours in the Media Elite Bus. 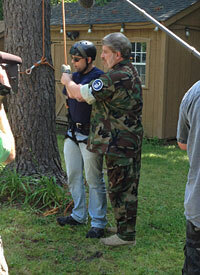 We eventually arrived at the Extreme SEAL Experience, which is owned and operated by real-life badass Don Shipley. Per Wikipedia, Don Shipley is a former U.S. Navy SEAL, expert trainer and media personality who provides his expertise to many media organizations. He retired after 24 years as a SEAL Senior Chief in 2003. He served in SEAL Team ONE, SEAL Team TWO, the Naval Special Warfare Center, BUD/S and Naval Special Warfare Group TWO in Little Creek, Virginia as a SEAL Advanced Training Instructor. Shipley conducted operations in Bosnia, Liberia and Africa while at SEAL Team TWO, and became the first non-corpsman SEAL to graduate paramedic school. He served in eight SEAL Platoons, was Platoon Chief in five, and was awarded the Navy and Marine Corps Medal for Heroism during a Search and Rescue Mission. Setting records for immense water and land demolition shots and running high-risk training courses, he also served as an Explosives Expert instructing police departments across the country in Booby Traps and Improvised Explosive Devices. When not in a SEAL Platoon or deployed overseas, his time was spent running blocks of training for SEALs in air operations, land warfare and demolitions. After retirement, he became a Blackwater Security Contractor, spending a year in Pakistan and Afghanistan fighting the war on terror. Don also runs a training course with fellow former U.S. Navy SEALs teaching and training men who aspire to become U.S. Navy SEALs. Don is also known to be at the forefront of bringing Stolen Valor to the limelight in the media, going after and exposing military impostors and frauds.